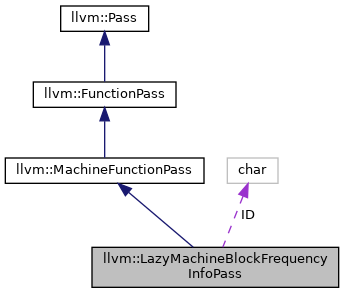 This is an alternative analysis pass to MachineBlockFrequencyInfo. 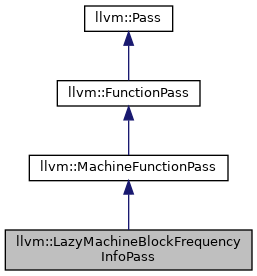 The difference is that with this pass, the block frequencies are not computed when the analysis pass is executed but rather when the BFI result is explicitly requested by the analysis client. This works by checking querying if MBFI is available and otherwise generating MBFI on the fly. In this case the passes required for (LI, DT) are also queried before being computed on the fly. Note that it is expected that we wouldn't need this functionality for the new PM since with the new PM, analyses are executed on demand. Definition at line 37 of file LazyMachineBlockFrequencyInfo.h. Definition at line 31 of file LazyMachineBlockFrequencyInfo.cpp. Definition at line 42 of file LazyMachineBlockFrequencyInfo.cpp. Compute and return the block frequencies. Definition at line 61 of file LazyMachineBlockFrequencyInfo.h. Definition at line 64 of file LazyMachineBlockFrequencyInfo.h. References F(), getAnalysisUsage(), print(), releaseMemory(), and runOnMachineFunction(). Definition at line 37 of file LazyMachineBlockFrequencyInfo.cpp. Definition at line 49 of file LazyMachineBlockFrequencyInfo.cpp. Definition at line 92 of file LazyMachineBlockFrequencyInfo.cpp. Definition at line 56 of file LazyMachineBlockFrequencyInfo.h.